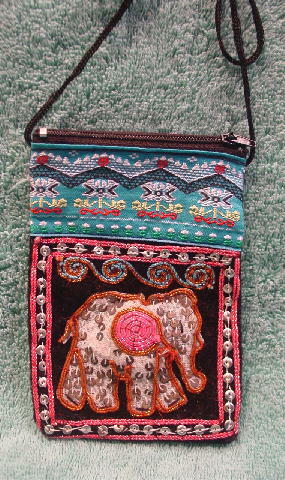 This fabric foreign-made little purse has a black fabric back and the front has an elephant on the lower half. The center of the elephant has padding with light golden brown and pink cording in its center. The elephant has a white background outlined in brown cording with silver sequins. The front has a black velvet backing edged in pink cording and silver sequins with an accent design in light golden brown and light blue cording. Above the cording is turquoise color fbric with embroidery in black, red-orange, yellow, and green. 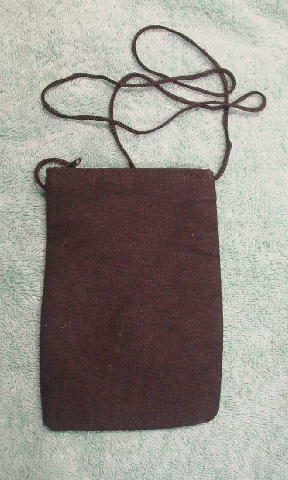 There is a zippered top and a 37" long by 1/8" wide black cord shoulder strap.